"Very professional, no hard sell. Answered all questions." Very professional, no hard sell. Answered all questions. Design Specialist was wonderful and very helpful. Handled A Job In Our Basement Very Efficiently.We found out about Quality 1st Basements by just doing a simple google search because they were one of the first companies that came up. I spoke to them about what we wanted to get done and they came up with a schedule for the work after we signed the contract. They pretty much did a complete waterproofing of our basement and also installed some drains as well. The job went pretty well but I was very worried about the mess throughout the whole process, however, they were able to clean up very well and really didn't leave much behind. Very Satisfied, The installation team was friendly, polite, professional, speedy but thorough. I have used this company for several years for various crawlspace issues. Very Satisfied with the job. Ken Peare's presentation was very explicit, explained in detail all my concern. Wilver Cardoza + Crew were great. Very hard workers. Great job cleaning up. The sales presentation sold me. I am writing to recognize one of your employees, specifically Randy Halal, System Design Specialist. Mr. Halal serviced our system on July 24, 2017. He was punctual (calling ahead of time), very professional and very courteous. He was extremely knowledgeable with the system and explained all service and/or repairs that he made. Meet Wilver, Our Waterproofing and Crawl Space Foreman! Wilver has been with Quality 1st Basements for over 7 years earning the title of Senior Foreman. He and his team transform wet and nasty basements and crawl spaces into dry and healthy spaces under your home. Wilver has great pride in his team and the work they accomplish each and every day. Take a look at some of the jobs they have completed below! A homeowner in Merchantville, New Jersey had water in their crawl space and contacted Quality 1st for a solution. Our System Design Specialist inspected the crawl space and recommended that the crawl space be sealed off so no more water, moisture or humidity would enter the crawl space. Drainage matting was first installed on the crawl space floors to give the water a channel underneath the crawl space liner. The matting has raised dimples so the water does not get trapped under the floor. CleanSpace vapor barrier system was installed on the crawl space walls and floors in order to keep water vapor and humidity from passing through. CleanSpace is a durable bright white liner that will not rip or tear making it perfect for storage use. A sump pump was installed to make sure the water entering the basement gets pumped out. The TripleSafe sump pump has three levels of pumps built in to ensure the crawl space stays dry and healthy. This crawl space is free of water and ready for the homeowners to use for storage. Wow! What an amazing Crawl Space transformation this is! Encapsulation is the perfect solution for a damp and smell crawl space for it completely seals off the area to keep it dry and healthy! A homeowner in Surf City, New Jersey was receiving water in their crawl space during heavy rainstorms and contacted Quality 1st for a solution. Our System Design Specialist inspected the crawl space and recommended that the crawl space be encapsulated to ensure that water does not enter. Clean Space vapor barrier system was installed on the walls and floors to make sure water vapor and humidity does not pass through. CleanSpace is the perfect solution for crawl space encapsulation and will not rip or tear so he homeowners can use the space for storage. 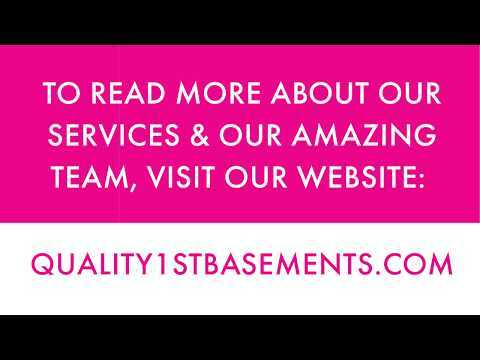 Quality 1st Basements helps homeowner everyday transform their dirty and damp crawl spaces into a clean and healthy space under their home by installing our Crawl Space Encapsulation System. This is exactly why a family in Forked River chose Quality 1st Basements to help them with a solution to their nasty crawl space. Our Crew installed our CleanSpace Vapor Barrier to the floor and walls of the crawl space to prevent water vapor and mold from damaging the crawl space. Sealing your crawl space off from the harmful outside environment not only creates better quality of air but also protects your structure. Our team also installed our SmartSump pump system and a Sedona Dehumidifier which was created specifically for the crawl space given its perfect size. A homeowner living in Berkeley Township had noticed a musty smell in their crawlspace and the odor had risen into their first level of their home. This is known as the Stack Effect. With the family now breathing in that air, the homeowner wanted to remove this musty odor from their crawl space right away. System Design Specialist, Jefferey Nero, inspected the crawl space and devised a solution. Jeffery suggested CleanSpace for it will seal the area off from water, moisture and anything else that could cause a musty odor. Cleanspace is a Vapor Barrier System that provides permanent moisture control and protection for any size crawlspace. Project Manager, Wilver Cardoza and his crew installed the Cleanspace to the floors and walls to eliminate the musty odor, creating a dry and healthy environment. Check out the before and after pictures of the amazing work done by Foreman, Wilver and his team. Before, this crawl space was a nasty, damp space underneath this Bayville, NJ home. The nasty air in this crawl space would travel up through the floor and throughout the rest of the home. Our team came in and with help from Design Specialist, Jeff Nero, our team was able to transform this nasty space into a healthy and clean crawl space area. Our products promote a dry, clean and healthy space to give our homeowners peace of mind when it comes to this space underneath their home. To seal this crawl space from water seepage, mold, moisture and other harmful things that could potentially negatively effect this crawl space and structure of this home, Quality 1st Basements installed our Moisture Vapor Barrier known as CleanSpace. To eliminate musty odors and cold floors, this homeowner contacted Quality 1st Basements to encapsulate their crawl space. Our Senior Design Specialist, Jeff N., headed out to inspect the site and our team led by Wilver completed the installation. We installed SmartJack Stabilizers to provide additional support to the floor joist and crawl space beams to prevent sagging floors and structural issues in the future. Our team also installed our CleanSpace Vapor Barrier System to prevent moisture and water from seeping through the foundation wall. Check out how our team turned this nasty and wet crawl space into a clean and dry space underneath this home. With the help of Collin Peare and Wilvers crew, Quality 1st was able to give this homeowner a healthier space underneath his home with peace of mind that he no longer has to worry about water when it rains. CleanSpace Vapor Barrier System is the perfect solution to any cold, damp or nasty crawl space! CleanSpace is a liner that is installed on the walls of the crawl space to seal it off from the outside environment. Water, moisture and mold are no match for this Vapor Barrier liner. Water was seeping up through the floor and walls of this sunroom in Spotswood, NJ. Our team came and removed the damage dry wall that had possible mold and replaced it with our Restoration Wall Panneling System. System Design Specialist, Steve V., also recommended our Elite Plank Flooring which is waterproof and mold resistent. With help from System Design Specialist, Kenny T. and Foreman, Wilver C., Quality 1st Basements was able to provide this East Brunswick, NJ homeowner will a brand new Window Well to help protect the basement window. Not only will it protect against rain, preventing basement leaks but also maximizes sunlight in the basement by reducing build up of dirt! After their sump pump failed during a rainstorm and caused their basement to flood, this homeowner contacted Quality 1st Basements for a solution. Our Senior Design Specialist, Jeff N., went out to the home to inspect the basement and proposed a solution to the homeowner. Jeff did a great job educating the homeowner and providing them with an explanation as to how the new system would work which is why they chose Quality 1st to provide them with a system that would give them peace of mind in their basement.Our waterproofing team led by Wilver installed a SaniDry XP Dehumidifier, WaterGuard & SuperSump Plus. The basement is now prepared for any amount of rain and completely moisture free! A homeowner in Piscataway Township, New Jersey was receiving water in their basement during heavy rains and wanted to replace their existing sump pump. Quality 1st System Design Specialist inspected the basement and sump pump and suggested that the TripleSafe sump pump be installed and replaced by the existing sump pump. The TripleSafe sump pump has three levels of pumps built in to ensure the basement is fully protected. In case of a pump failure, the other lower level pumps will kick in to make sure the basement will be free of water. Quality 1st Basements received a call from a homeowner who was experiencing large puddles of water in their basement. Customer Service Representative, Keashan was able to get Mike B, our System Design Specialist, out right away to inspect the wet basement and provide a solution. By installing a full WaterGuard drainage system and a TripleSafeSump Pump, the basement is now completely waterproofed. To remove the musty odor, a SandiDry Dehumidifier was installed to circulate dry air throughout the large space to create a more comfortable, healthier environment. This homeowner had an older sump pump that was failing. Quality 1st Basements was able to remove the old one and install one of our TripleSafe Sump Pumps. The TripleSafe Sump Pump is fully equipped with three pumps. Pump 1 does the majority of the work, Pump 2 is there to assist Pump 1 if needed, and Pump 3 is a battery operated pump that kicks in if the power goes out. All three of the pumps are in the same liner and have an alarm system attached that will go off to notify the homeowner if the pump is failing. Our System Design Specialist, Mark Kleiner designed the Ultimate solution for the sagging floor joist in the basement of this Point Pleasant, NJ home. 20 PowerBraces and 6 SmartJacks were installed for additional support to the floor joist to prevent further sagging and movement. First, Wilver and his crew install the PowerBraces against the floor joist beams then SmartJacks were installed for supplemental support. Homeowners in Matawan, New Jersey had an old sump pump that they wanted to upgrade. Quality 1st installed the Triplesafe sump pump in the basement. The TripleSafe provides three levels of protection, with three pumps built in. In case of failure, the other lower level pumps can take over. The TripleSafe also has an UltraSump battery backup system that can pump 11,500 gallons of water on a fully charged battery. Take a look at this transformed crawl space in South Amboy, NJ! Our Quality 1st Team was able to waterproof and encapsulate the space. Additionally, we were able to get rid of what appeared to be mold and debris- ensuring clean air that is completely safe and healthy for the homeowners to breathe in! After experiencing flooding in their finished basement, a homeowner in South Amboy contacted Quality 1st for a solution. The lower half of the wall in their basement had been damaged from the flooding so in addition to installing a sump pump, Wilver and his team installed EverLast Wall Panels. The Paneling is made of inorganic materials to prevent mold and withstand any water or humidity that could potentially enter the basement. The home is now fully protected and water-free!